He and his wife Rachel are expecting a new addition to their family, a baby girl! His son Jack is super excited! CFM: What do you like about workout out at CF Mass.? CFM: What have you done that you never thought you could do? CFM: What’s your next goal? CFM: What would you tell someone who was afraid to join? CFM: What do you like about workout out at CF Mass? LR: The Coaching Staff and the program are all solid; all the people are inspiring and fun! CFM: What is your next goal? CFM: What was your favorite part of the New You Challenge? LR: Besides the camaraderie, it would be how quickly I saw results. Encouraging, and satisfying. LR: I was afraid, too, but it was a great group of people, and the coaches helped me “get out of [my] head. “ That’s when good things started happening—gained strength and lean muscle, increased endurance, and got off meds. In 2016 Jason underwent knee surgery to repair damage to his ACL, MCL, meniscus, and cartilage. Growing up he had always been active in playing soccer. But the operation diminished his activity levels, and traditional gym workouts were getting boring. Understandably his energy levels dropped, and the scale started to creep up. Then last fall Jason came to CrossFit Mass. After meeting with our coaches, he got to work. — put on 5.7 pounds of muscle — dropped almost 3% body fat! JB: I like working out and competing in a group atmosphere. It pushes me to work harder not only during the work out but also during training. I like that the coaches are always watching and correcting our exercises. JB: Starting CrossFit the mobility in my knee was not 100% so I was a little nervous about doing some of the exercises. Taking it slow and getting the movements down has not only increased my confidence in my knee but also my mobility and strength. JB: My goal is to be able to work out at a higher level and complete the RX movements for each work out. CFM: What was your favorite part of the JumpStart program? JB: My favorite part of the Jump Start program is learning the movements and the reasons behind the movements. The classes are small and the coaching staff is teaching you and watching your every move to make sure that you’re exercising correctly. JB: The Jump Start program is the best way to enter into a new type of working out. The coaches train you at your level. There are different movements for every fitness level and scaling the movements to match your fitness and gaining muscle, weight loss and mobility is sure to happen for you no matter where your fitness level is. Jump Start is a full body fitness and the coaches are more like personal trainers during your sessions and give you the time that you need to explain the movements so that you won’t hurt yourself and to ensure that you’re getting the most out of your sessions. I recommend this program for anyone that has goals of losing weight or becoming more physically fit. 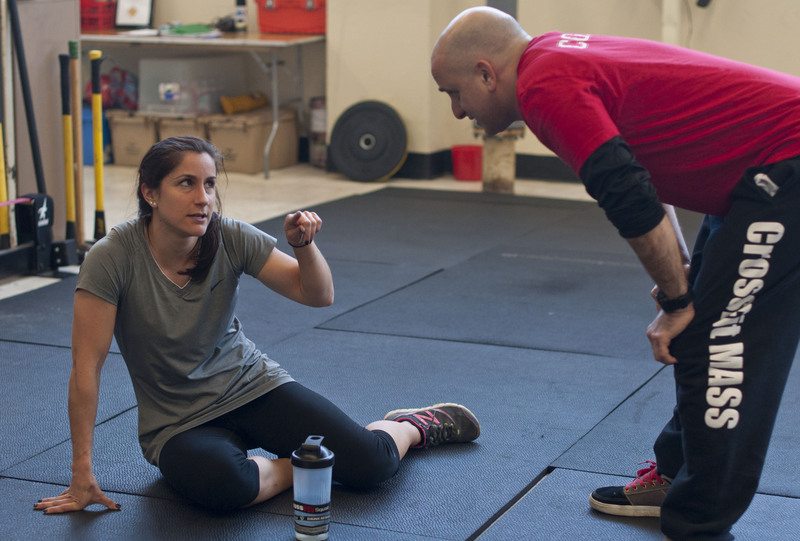 CFM: What do you like about the workouts at CrossFit MASS? DG: I like that the workouts have a lot of variety and drive me to push myself to find out what my personal “best” is for the WOD everyday. Also having the coaches there to give you what you need (instruction, tips, life saving info) is a big plus to me. DG: I’d have to say the whole experience so far has been something I never thought I would/could do. I’ve always been a very active person, but I never thought about lifting weights, working out in groups, or any of that. So walking through the door the first time to give it a go was a big thing for me. DG: I don’t think there is enough space to list all of my goals, but the main one is increasing the chin ups to hopefully do a pull up! It’s going to happen, eventually. CFM: What’s your favorite CrossFit MASS memory? DG: Stop being afraid and start being productive! The results you earn, and experiences you gain will make you wonder why you didn’t start sooner. So just start now and you’ll be thankful you did. CFM: What do you like about working out at CrossFit MASS? EM: There are so many things that I love about working out at CrossFit MASS! I’m still always learning – a new movement, an interesting weight complex, varying mobility work, etc. The workouts are well planned and challenging and I find that I don’t want to miss a workout simply out of curiosity. The addicting part also is that you can see progress, even compared to previous weeks. It’s a huge motivation that keeps me coming back each week. Most importantly, I love the people – there’s nothing like a tough workout that can bring people together. EM: I never thought I could do any of it! I barely knew what CrossFit was when I first started. My first day at the gym was intimidating, people doing pull-ups, large amounts of weights being moved around, people jump roping at high speeds, rowers being spun up at a high pace, it was all chaotic! I had never picked up a barbell before that day. I am amazed that after the first year, I could do all of these things. In learning each new skill and lifting heavier weights, I love doing a workout and feeling good about how far I’ve progressed since that day one. EM: I have to pick just one goal??? Butterfly pull-ups, handstand push-up, muscle-up (I narrowed it down to 3). In the end, I’m happy to just keep progressing on all fronts – strength, skills, and overall fitness. EM: One of my favorite memories is the night that Pam and I got PR’s for the back squat at 225#. We had been working out together, building strength, and pushing each other to improve. So it was an exciting and rewarding moment. supportive and are great to spend time with. Spartan Trifecta by the end of the summer. I would never be able to accomplish this without CrossFit. DT: Double unders! It’s a goal that I’ve been putting off for a while, but I need to get back to it! holding me back from a long term goal at trapeze. Much to my surprise that day, not only did I do a chin-up, but did a 10# weighted chin-up! CFM: What do you like about workouts out at CrossFit MASS? TL: The single most important part for me is the coaching. Knowing that the coaches are always watching out for correct form to avoid injury is extremely important and proper form accelerates strength development. technique, I’m amazed at my progress. CFM: How has CrossFit MASS helped you with your OCR prep? TL: OCR is all about testing strength, especially upper body, stamina, and overcoming fear. Carrying 60 pound sandbags up a ski slope, climbing ropes, negotiating monkey bars, lifting 100 pound cement balls, and more would be impossible without the strength training I get at CrossFit MASS….and, yes, thank heaven for all those squats! TL: I’m fortunate to participate in many of the crazier OCR events with my daughter. Our goal this year was to attain a “double trifecta” at Spartan. That requires competing in a Spartan Sprint (about 4-5 miles), a Super (about 9 miles) and a Beast (12-17 miles). We attained our first trifecta when we completed the Spartan World Championship in Vermont – 9 hours 26 minutes of torture! Proud to say I was 5th in my age group. We just completed the S Carolina Beast last Saturday (2nd in my age group), followed by the Spartan Super (1st in my age group) on Sunday…long weekend! Next is the Spartan Fenway to complete my double trifecta. TL: The first time I saw Christy! TL: CrossFit is a custom designed program that can improve the strength of anyone. The workouts can be scaled and the classes are without judgment (except when my form is not perfect!). 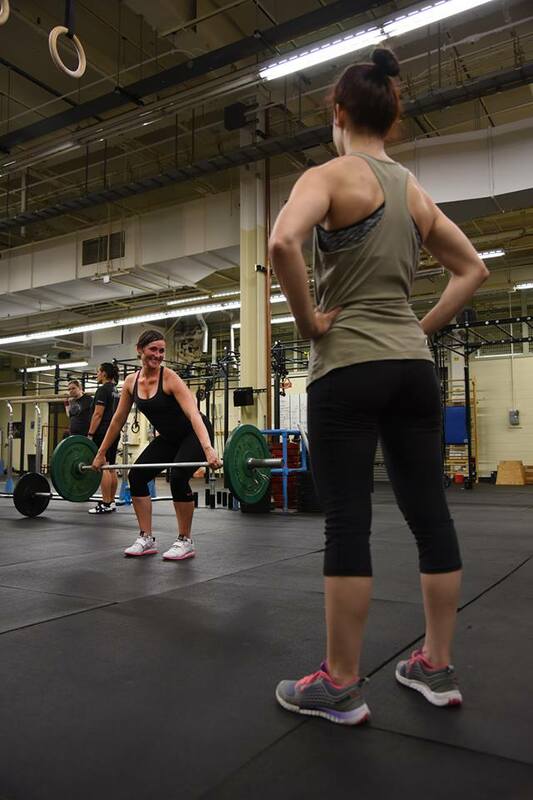 CFM: What do you like about workout out at CrossFit MASS? KG: I like how each work out is different and the trainers work with me to make sure I don’t hurt myself. KG: Getting closer to actually being able to do a push up. KG: To actually do a real push up and someday a pull up. KG: The day I went to class with John & Joseph (my sons) and they had to do burpees for throwing me under the bus for being late. All of the guys were telling them never to throw their mother under the bus!